Forum Index \ CameraFTP Customer Support Forum \ Why my cameras stopped uploading? Subject: Why my cameras stopped uploading? A few customers reported the following problem: They configured their cameras to upload to CameraFTP; and the cameras worked fine for a few days and then stopped working. There are many reasons that could have caused the problem. This message tries to shed some light on how to trouble shoot it. First of all, please check if your camera is still powered on and connected to the Internet. Most cameras have LED lights indicating different status. A quick power cycle might solve the problem. Sometimes the problem is with the router, so you might want to reboot your (wi-fi) router as well. We have noticed that the problem is more often caused by your cameras not configured with correct parameters. (1) Image or video recording. The video recording and Image recording plans are separated in two different tabs (sections). Please Note: not all cameras can upload video clips. (2) Image or video resolution. (4) Motion recording or continuous recording. In general, motion recording can save up to 50% over continuous recording. (5) Retention days. (You don't need to configure it; as this is completely managed by our server). When you configure your camera, you must make sure that your camera is configured based on (1), (2), (3) and (4) of your subscribed plan. If you incorrectly configured your camera, and if the configured parameters are lower than the parameters of your ordered plan, then your camera will not be blocked. On the other hand, if your camera is configured with higher parameters, CameraFTP will offer some grace period, and if the problem is not resolved in a timely manner, your camera will be blocked from uploading. Event center is also available on our CameraFTP Viewer app for iOS and Android. 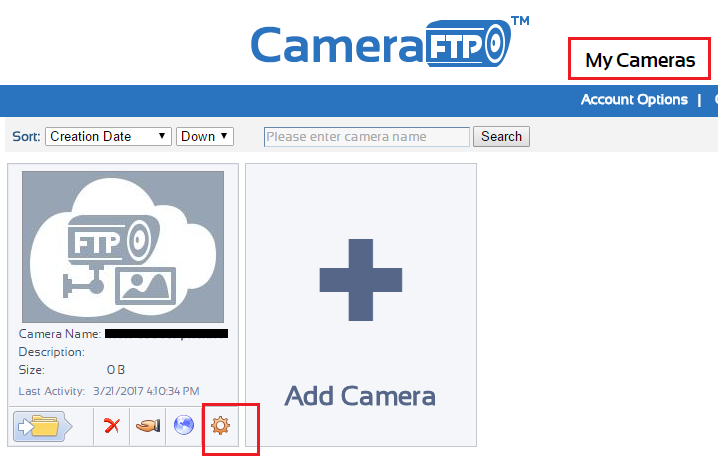 You can visit App Store or Google Play store and download the CameraFTP Viewer app. Note events are automatically deleted after a few days. If you don't check your messages after a few days, then you could miss a few messages. (A) The user has two cameras in his account when he only has one camera license. If one camera is not connected, you can delete it online by clicking the Delete icon below the camera thumbnail. Note a separate secure password is required to delete a camera or recorded footage. (B) All 4 parameters are incorrectly configured. As mentioned above, these parameters much match the ordered plan (or lower than the ordered plan.) 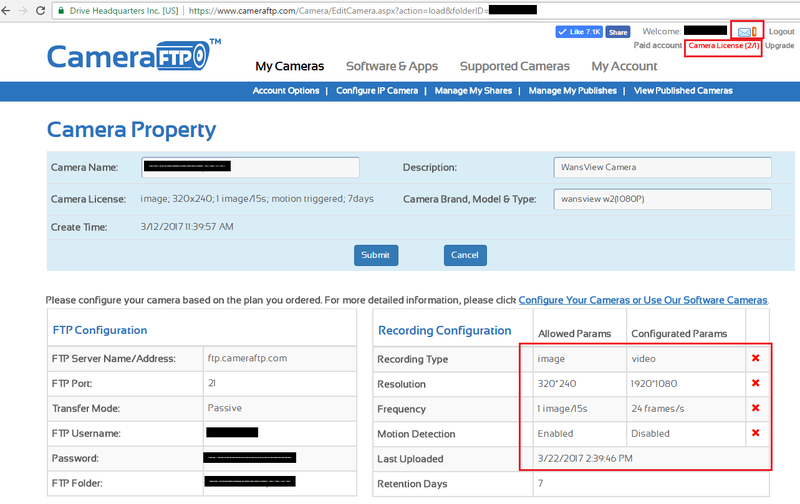 To fix the problem, you must log on to your camera's configuration page (NOT CameraFTP.com website). You need to find the camera's IP address and connect to it with a web browser. Not all cameras can support all parameter values. Low-end cameras usually cannot record video clips (e.g. D-Link DCS 932L, 934L, 930L, 931L); some high-end cameras can only upload image/video resolutions higher than 720P (1280x720). If your camera cannot be configured based on your ordered plan, then you can also upgrade your service plan. Just order a new subscription based on your camera's capabilities, and then cancel your current plan. After you have fixed the parameter problem, CameraFTP's FTP server may still block your camera for some time. You can delete some files in the camera folder, or wait for a couple hours.